Whether you already make sermon podcasts or have never heard of podcasting, discover how a Podcast Ministry can keep members engaged and extend your teaching and training. This article and this podcast episode will give you an overview of how podcasting can help your church overcome problems like the lack of engagement from church members. It has the potential to keep your church members engaged like nothing else. We’ll also talk about how podcasting can help with teacher training and ministry training of all kinds. It can extend your teaching and ministry training in ways you’ve never thought about before—I promise you. Together, let’s explore what’s possible in your church and any ministry you create to serve others in your community. But first, let’s make sure we’re on the same page, so to speak. A podcast is a show. It’s like a tv show or a radio show. You listen to podcast shows on your smartphone, smart watch, tablet, laptop, or desktop computer. A podcast is like talk radio, but better. It’s better because you can listen whenever you want. Call it on demand or just call it convenient. When you have time, you can listen. It’s better because you can to listen wherever you want. Most podcasts are audio, and because of that, you’re not tied to a computer screen. People listen to podcasts while commuting, exercising, shopping for groceries, cleaning the house, mowing the yard, and walking the dog. It’s better because there are shows on almost any topic under the sun. There are thousands of different shows that talk about thousands of different things. People are not limited by what’s on TV or radio anymore. They could be listening to you. Let’s look at your church. Have you ever calculated the actual time you spend preaching and teaching? No matter how long you actually talk during a sermon or Bible study, it’s usually less than one hour each week in the lives of people who hear you. And that’s assuming they attend church every single week. The influence you have with your words is very small compared to other voices they hear every day. A podcast ministry can change that. A Podcast Ministry encourages engagement with your church. As church members choose to listen to your sermon or Bible study when and where it’s convenient for them, they are more likely to be engaged with your church. Certainly a podcast ministry can be a blessing to those who are sick, or in the hospital, or unable to get out of the house to make it to the church building. But a podcast ministry can reach many others. Think about the church members who have to be at the office or work site while you teach and preach. Consider those who are on the road (for their job or family trips). Also think about the overwhelmed, over-tired, overwrought couples (and single parents) with babies, toddlers, preschoolers, and elementary school kids. My wife and I have personally experienced the life-changing impact of little ones. During that season of life, parents have to be more selective about activities and events, especially if those happen in the late evening after a long day. In the past, it was easy for church members in those situations to slip away. They get busy and overwhelmed, and the church is unable to keep track of everybody. After awhile, people get caught up and lost in the busyness of life. Keep up with what’s going on at church. Hear inspiring, comforting, and challenging messages from the pulpit and Bible study. When they’re unable to meet together, they can stay engaged with your church through a podcast. A podcast ministry can help your teachers. How often have people been quickly recruited to fulfill that awesome responsibility of teaching your children in church? **Most volunteer teachers in church do not receive any kind of teacher training. No matter what you teach or who you teach, there are certain principles of teaching and managing a classroom that new teachers need to learn. It’s a disservice to make them try to figure it all out on their own. Teachers need teachers to teach them how to teach. And that’s where a podcast ministry can help. New teachers can listen to teacher training on the go. They can listen to experienced teachers offer insights and advice on how to prepare, how to actually teach during class, and how to follow up with their learners after. And it doesn’t stop with teaching teachers. All volunteers need education and encouragement to be effective in all ministries of your church. You can make a podcast that will equip them, too. They can listen and learn on the go, where and when it’s most convenient for them. If you’ve never made a podcast before, you need a podcast teacher to teach you how to podcast. Podcasters need to buy equipment (and learn how to use it). Podcasters also need to decide what to say (and how to say it) in a way that makes sense in audio. This is how to get started. 1) Listen to episodes of the OnTheGo.FM podcast. I’ll be talking about how to make your message mobile. 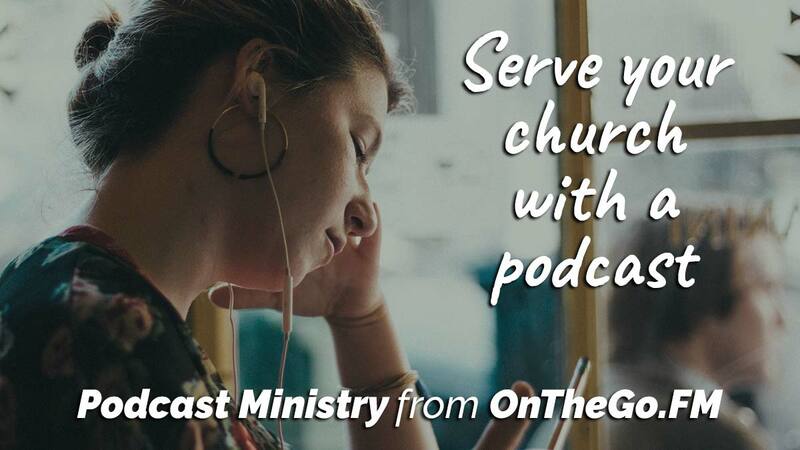 A podcast ministry is one that will serve your congregation and community. I’ll be talking about that on the show along with other things you can do with a podcast. Subscribe here to get every episode on your mobile device. The guide is a handy 1-page PDF you can print and post in your office or on the refrigerator. Already have a podcast ministry? Tell me about it. Curious to learn more about podcast ministry? A sermon podcast is the easiest way to get started, but there are many other ways.